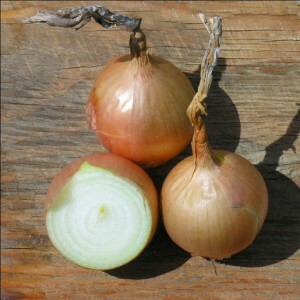 The United States Department of Agriculture, Agricultural Research Service, announces the release of onion inbred B8667 A&B, for the production of red, long-day, well-storing hybrids. 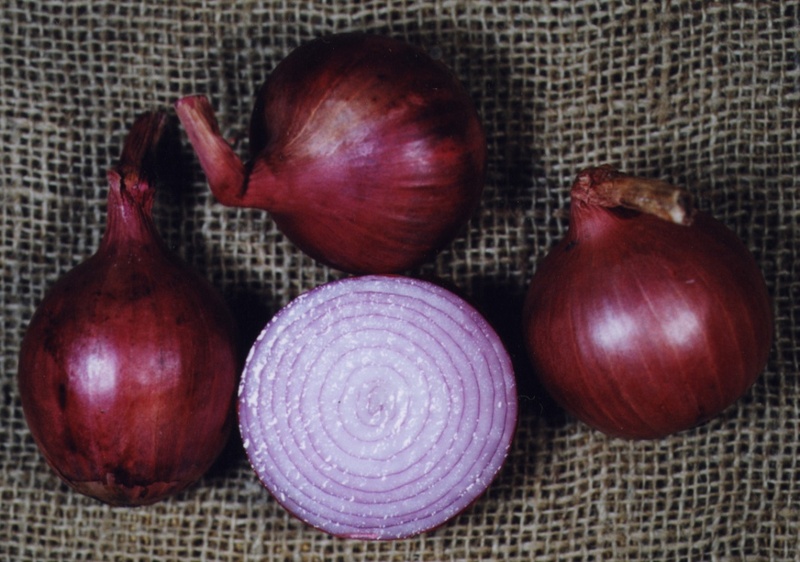 This inbred line was developed by Dr. M.J. Havey and is round in shape, dark red with color extending through the internal rings of the bulb, firm, with good scale retention and excellent storage quality when produced on muck soils. B8667B is a F1MSMS2M3 from USDA Plant Introduction 262985 (‘Noord Holland Bloodred’) crossed with B5361B (a red inbred developed by the late Dr. C.E. Peterson, but never released). This inbred has a soluble-solids content of 13.4% and is relatively pungent at 10.7 mM pyruvate per ml. The cytoplasmic male-sterile A line is a BC7. Testcrosses of B8667B to a series of male-sterile F1 lines (MSU611-1A×MSU611B, MSU5718A×MSU8155B, B3350A×B2352B, B1731A×MSU5785B, and B1750A×B1794B) produced only red bulbs and yielded in the top one-third of commercial and experimental hybrids evaluated over years at the Kincaid Farm, Palmyra, WI. The Agricultural Research Service of the United States Department of Agriculture announces the release of the long-day onion synthetic population “Sapporo-Ki (SKI) -1”TM A&B. Sapporo-Ki is an open-pollinated population grown on the Japanese island of Hoikkaido and has relatively high frequencies of both S cytoplasm and the dominant allele at the male-fertility restoration locus (Ms) (Havey 1995). This synthetic combines the earliness of Sapporo-Ki with maintenance of cytoplasmic-male sterility. Random plants from Sapporo-Ki were self-pollinated and testcrossed to male-sterile plants of MSU611-1A-MSU611B or MSU5718A-MSU8155B. The S1 families were evaluated for their cytoplasm using the molecular markers as described by Havey (1993). Testcross families from these N-cytoplasmic plants were scored for male-fertility restoration (Gokce and Havey 2002). S1 families that were N-cytoplasmic and homozygous recessive at Ms were selected. Five S1 bulbs from each of eight families were caged, allowed to flower, and intercrossed using flies, followed by three generations of seed increases. The cytoplasmic male-sterile A line is a BC5. Bulbs of this synthetic population are yellow, very early maturing in Wisconsin, and have good storage ability. Gokce, A.F., and M.J. Havey. 2002. Linkage equilibrium among tightly linked RFLPs and the Ms locus in open-pollinated onion populations. J. Amer. Soc. Hort. Sci. 127:944-946. Havey, M.J. 1993. 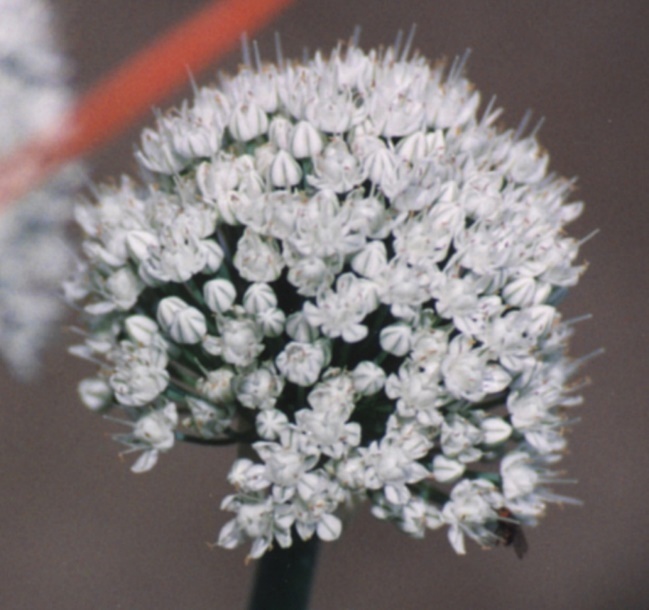 A putative donor of S-cytoplasm and its distribution among open-pollinated populations of onion. Theor. Appl. Genet. 86:128-134. Havey, M.J. 1995. Cytoplasmic determinations using the polymerase chain reaction to aid in the extraction of maintainer lines from open-pollinated populations of onion. Theor. Appl. Genet. 90:263-268. The Agricultural Research Service of the United States Department of Agriculture and the U niversity of Ljubljana announce the release of the long-day onion synthetic population “Onion Haploid (OH) -1”TM. The purpose of this population is to serve as a responsive control for extraction of gynogenic haploids of onion. Random plants from the relatively responsive inbreds B2923B and B0223B were evaluated for gynogenic haploid production as described by Bohanec and Jakse (1999). Plants that produced relatively high numbers of gynogenic haploids were self-pollinated (Bohanec et al. 2003). Five S1 bulbs from each of 10 families (nine from B2923B and one from B0223B) were caged, allowed to flower, and intercrossed using flies. Plants in this synthetic produced on average 12 gynogenic haploids for every 100 flowers plated. Bulbs of this synthetic population are yellow with good storage quality. All plants in OH-1 should be homozygous recessive at the Ms locus, although this has not been evaluated. Bohanec, B., and M. Jakse. 1999. Variations in gynogenic response among long-day onion (Allium cepa L.) accessions. Plant Cell Rep. 18:737-742. Bohanec, B., M. Jakse, and M.J. Havey. 2003. Genetic analyses of gynogenetic haploid production in onion. J. Amer. Soc. Hort. Sci. 128:571-574. The United States Department of Agriculture, Agricultural Research Service, and the Wisconsin Agricultural Experiment Station announce the release of an alloplasmic source of cytoplasmic male-sterile for use in production of onion hybrids. The cytoplasm of Allium galanthum Kar. et Kir. USDA plant introduction 280091 was backcrossed for seven generations to bulb-onion populations. The initial interspecific hybrid and four generations of backcrossing were generated by Dr. Gilbert McCollum, USDA-ARS, Beltsville, MD, and were released by the USDA in 1988. The BC4 populations segregated for male fertility and produced commercially unacceptable bulbs of varying colors. An additional three backcrosses to long-day yellow storage germplasm produced competitive bulb types. The flowers of galanthum-cytoplasmic populations possess filaments with no anthers and upwardly curved perianth, making identification of male-sterile plants easier than for either S- or T-cytoplasmic male-sterile onion plants. Mean seed yield per bulb of the galanthum-cytoplasmic populations was measured in cages using flies as pollinators and was not significantly different from one of two S-cytoplasmic male-sterile F1 lines, a T-cytoplasmic male-sterile inbred line, or N-cytoplasmic male-fertile lines. Galanthum CMS lines were crossed with populations known to be homozygous dominant and recessive at the nuclear locus conditioning male-fertility restoration of S cytoplasm and progenies scored for male-fertility restoration. Nuclear restorers of S cytoplasm did not condition male fertility for the galanthum-cytoplasmic populations, meaning that any bulb onion population can be used as a maintainer of the galanthum CMS population regardless of its cytoplasm or genotype at the nuclear male-fertility restoration loci. 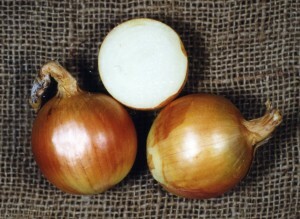 It is intended that these galanthum-cytoplasmic onion populations be used as an alternative male-sterile cytoplasm for the commercial production of hybrid-onion seed. Havey, M.J. 1999. Seed yield, floral morphology, and lack of male-fertility restoration of male-sterile onion (Allium cepa) populations possessing the cytoplasm of Allium galanthum. J. Amer. Soc. Hort. Sci. 124: 626-629.